There is no “bad” dog behavior, just “natural” dog behavior. All dogs bark, chew, dig, etc., these are all a natural part of what dogs do. However, we can help them understand what is expected and modify their behavior so they can become well-mannered family members. 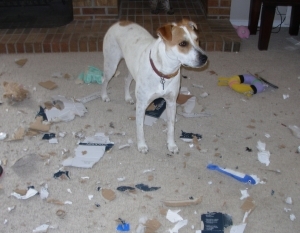 With an in-home behavior consultation, I will take the time to fully understand your dog and the behaviors presented. I will give you a simple and easy to understand behavior modification and management plan using positive reinforcement methods. When determining possible causes for the behavior, we will look at a variety of things such as exercise, environmental stimulus, breed characteristics, personality, socialization, diet and medical conditions. Some of the common behavior issues I can help you solve.